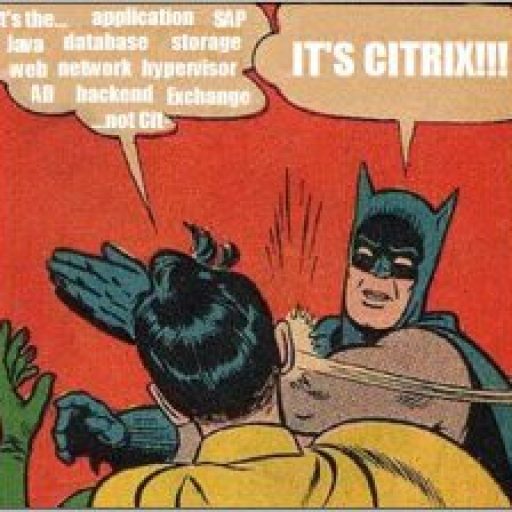 Citrix’s acquisition of NetScaler was just the beginning. With Mark Templeton’s keynote the reach of the NetScaler brand has lengthened to include NetScaler Cloud Gateway and NetScaler Could Bridge. Meanwhile the NetScaler engineering team has not been idle. I will briefly cover the talking points from this session. The following features are/will be available on n-core NetScalers running firmware 9.3 (or later). Customers have asked that the NetScaler be a multi-tenant device with the ability host multiple applications with CPU and memory isolation. So the NetScaler and XenServer engineers threw their 2 products into a locked room with some romantic music and let nature take its course. The result is NetScaler SDX. This is a hardware appliance running a number of NetScaler VPX’s on top of the XenServer hypervisor. The two teams discovered that when you virtualize the NetScaler to provide this functionality, you can reduce performance. 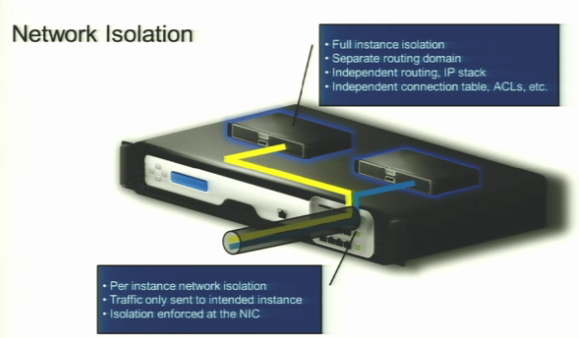 In order to solve this issue the NetScaler team has implemented SR-IOV (Single Route IO Virtualization). Each instance gets full network isolation for layer 3 and above and layer 2 isolation via VLAN tagging (of each instance on the NetScaler SDX). In order to configure all this, the NetScaler team has provided a Service VM. 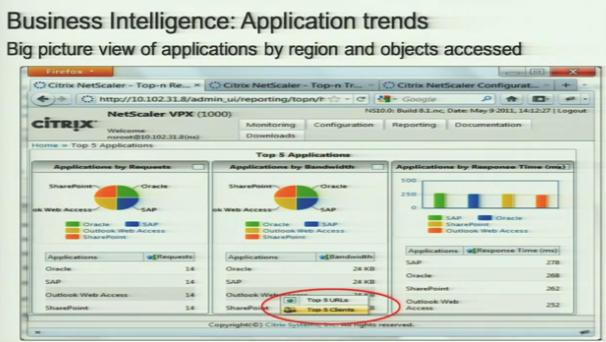 All the typical VM management operations are available except snapshots. This is coming as soon as the NetScaler team determines how to snapshot an instance and not have an IP conflict. Also, the instances are discreet within their SDX appliance. You cannot failover a VPX instance from one SDX machine to another, but later I will cover NetScaler pools which can solve this issue. The next feature that is in development is an analytics engine. This will allow for better troubleshooting, capacity planning, quantifying of the user experience, application monitoring and business intelligence, basically providing the features that EdgeSight provides in XenApp. 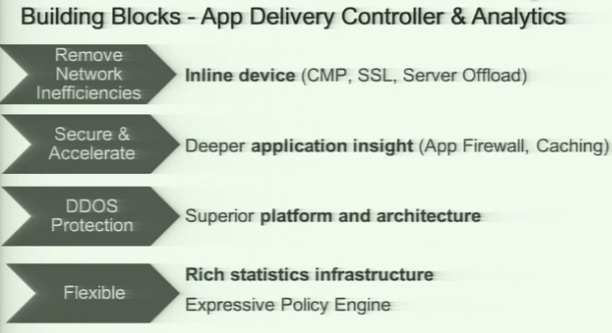 The following features not only establish the NetScaler as superior Application Delivery Controller but are also the building blocks for an analytic device. For this use case, they combined Syslog data with Google Maps to visualize users connecting to the resources on a world map. 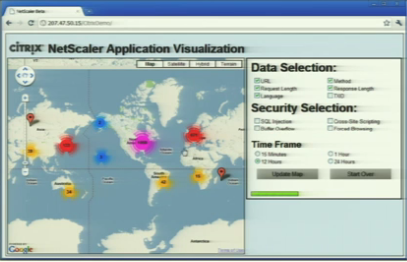 This example was very demonstrative of the data that NetScaler can collect and merge with other data sets. 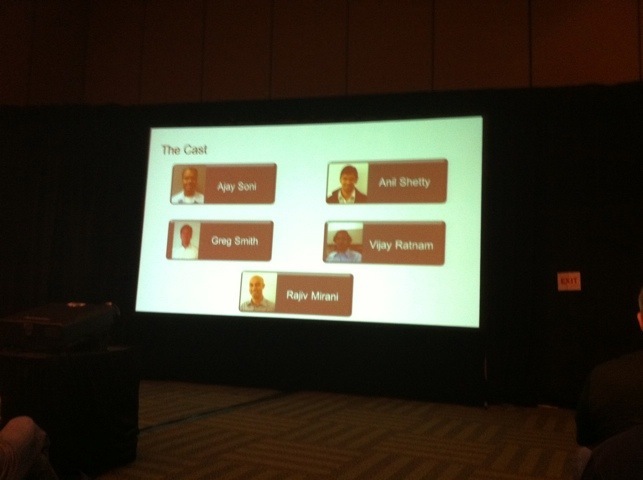 However, there was scant detail on how NetScaler Director will look in the future or what functionality it will have. The next development is the concept of a NetScaler Pool. This will allow you to create pools of NetScalers (VPX) that will dynamically failover and recover. 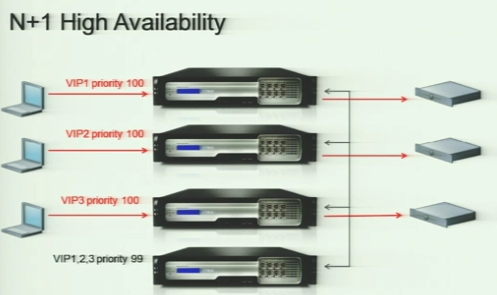 Typically most deployments will have either an active-passive or active-active HA NetScaler pair. Using VRRP (Virtual Redundant Routing Protocol), VIP’s are given different priorities depending on different NetScalers. Expanding on this concept we can create an N+1 HA configuration. Essentially this leaves one NetScaler that contains all the VIPs in a lower priority as a hot spare. Frankly, this feature is the most significant one presented and it is now available. 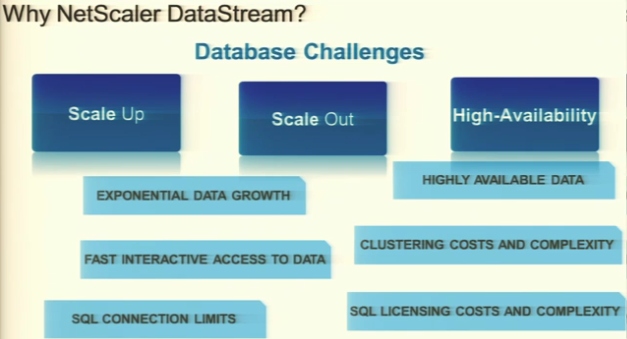 DataStream allows you to leverage the power of the NetScaler to accelerate your database tier. 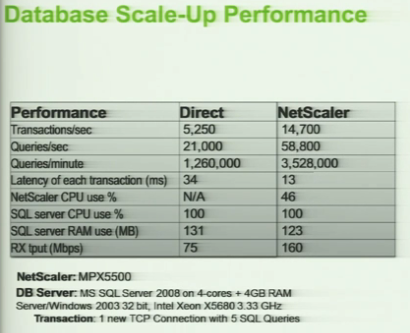 NetScaler has been a proven platform to accelerate web sites, but leveraging it to accelerate database transactions is huge. Inserting the NetScaler in front of your Web/App servers allows you to support millions of client-side connections, faster connection establishment to the backend databases, SQL proxy support for MySQL and MSSQL, and granular SQL policy control. 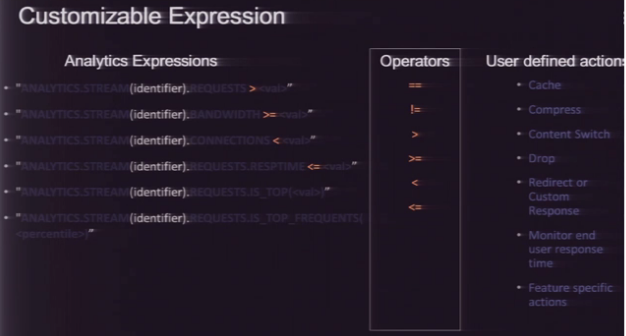 At the same time the NetScaler provides fewer multiplexed server-side connections to the database servers, longer lived server-side connections, and native SQL request/response protocol visibility. 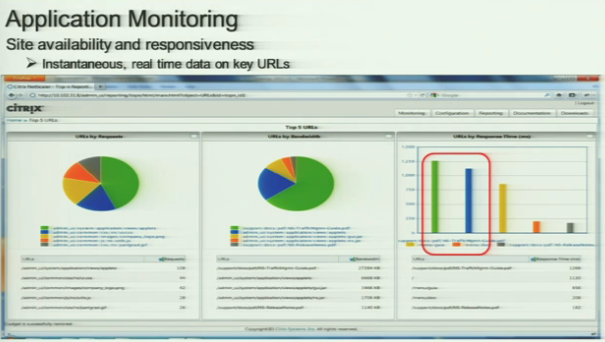 First the demo query without the NetScaler. 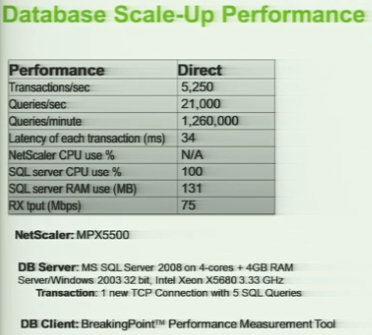 Then a SQL Virtual Server was created on the NetScaler. Keep in mind that in this demo the same query was used over and over, but this shows how the caching and acceleration in the NetScaler can improve transactions with the database tier. 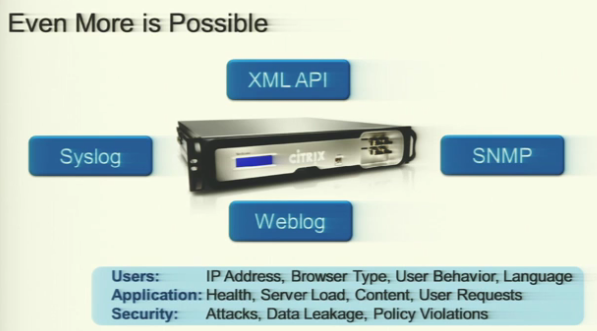 Also note that a single MPX was used and you can imagine if this technology is implemented on the NetScaler SDX. There were several other sessions that covered various NetScaler technologies. 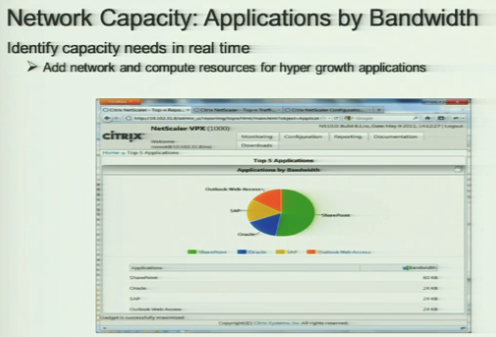 I urge you to view the Synergy sessions that are now available on the Citrix site.